Are you getting cubicle fever? Are you looking for a new career? Have you ever thought about going into business for yourself, perhaps even joining the ranks of other thrill seekers drawn to a fulfilling life spent busting ghosts? We’ve done the research, and a LOT of folks these days are ditching the 9-5 for more nontraditional career paths. Turns out, it's a lot easier to break into this highly desirable field than you might have originally thought, despite its extremely low turnover rate. 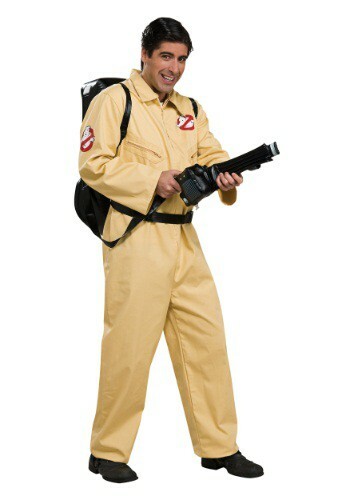 Venkman, Spengler, and Stantz may have had fancy degrees, but all you’ll need is this Adult Deluxe Ghostbusters Costume and the intense desire to rid your neighborhood of those pesky paranormal visitors. Just tell your folks you took a “work from home” position that requires frequent travel and Skype meetings (with some seriously menacing spirits). This gig even comes with a company car (the Ecto-1), unlimited streaming data and calls (‘cause when your slogan is “who you gonna call?” your phone can’t go straight to voicemail), and a great benefits package (just check out that proton pack!). So ditch the suit-and-tie look for this iconic jumpsuit—even if only for a night. The official Ghostbusters patch proves you’re no intern, so you can feel immediately successful in your new venture. We’re proud of you for living your dream and we know the world is safer with you in it. Now go and get those ghouls! Just, you know, maybe look into a health plan with a lower deductible. Just in case.